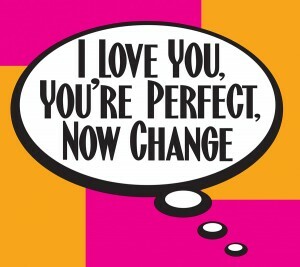 “I Love You, You’re Perfect, Now Change” is insightful look at relationships! Midtown Arts production of “I Love You, You’re Perfect, Now Change” evokes memories of dating, marriage, and all…. The show’s title tells it all as fun and foibles of dating and marriage take center stage in “I Love You, You’re Perfect, Now change” current at Midtown Arts Center in Fort Collins. The popular review has been charming audiences worldwide since its inception Off-Broadway in New York twenty years ago. The show has something for just about every dating or married couple. We see a couple on their first date. They claim they are uncomfortable in early dates, and opt to fast forward to second, third and all dates, concluding their friendship with no dates! Then there is the senior couple whose spouses have died, and the remaining widow and widower spend their days attending funerals of persons they don’t know — looking for possible match-up dates with other funeral-goers. Current cast in the Midtown production is very good, headlined by Joel Adam Chavez who is an instant charmer with his wonderful facial expressions and ability to take on roles from the dating movie-goer to the senior citizen at the funeral home. He is a familiar face to local audiences. He is especially heart-warming as the macho date, dragged to a chick flick tear jerker. He prefers action westerns, heavy on violence; but ends up sobbing hysterically being reduced to mush at the two-hanky sob story his date insisted on seeing. Also well known to local audiences is Anne Terze-Schwarz, a tall beauty with an equally beautiful voice. Rounding out the quartet of performers are Morgan Howard and Sean Wilcox, both newcomers to MAC productions. Each of the four players has an individual moment to shine, as well as playing multiple roles for other sketches. Morgan amazes as she jumps to a full dancing split! Sean Wilcox has very good stage presence and is enormously charming. His singing voice is very good, and his acting skills are effective. Music is by Jimmy Roberts, with book and lyrics by Joe DiPietro. The songs are pleasant, but not particularly memorable. The sketches range from great fun to heartfelt somber memories. Among the highlights, in addition, to those mentioned earlier, are Wilcox visiting some married friends whose entire existence is currently revolving around their new baby; the family “traveling” around the stage reminding us how dreadful family trips by car can be; the husband who is bogged down with Macy shopping bags while his wife runs around the store trying to find a restroom; and a super sketch where married parents are hosting a dinner for their son and his girlfriend of two years, expecting the couple is about to announce their engagement. The parents are horrified as the young friends announce they are splitting up – with the mother tossing the gift she had brought thinking a wedding announcement was soon to be made. Seth Caikowski directs the goings-on. He is highly respected for his acting skills, having received the Colorado Theatre Guild Henry Award a few years ago for his looniness in “The Drowsy Chaperone” at Boulder Dinner Theatre. This is the third production of “I Love You…” that Caikowski has directed. Midtown Arts Center is presenting the show in their smaller cabaret-style room. This is a slightly different format from shows featured on their main stage. No meal is provided, but appetizers and drinks are available prior to the show, with dessert at Intermission. The show premiered Off-Broadway in New York in 1996 and closed in 2008, after more than 5,000 performances. It has been produced worldwide and translated into at least 17 languages. The themes presented are universal. Playwright DiPietro touches on romantic themes that are instantly relatable – sometimes with discomfort, sometimes with outright joy! Previous Post“Mrs. Mannerly” is great fun at Arvada Center for the Arts and HumanitiesNext Post“Hide Sky” Features three talented performers portraying a family at loose ends.